Facing an industry downturn, GATE decided to focus on its future. The company is a consulting and engineering firm that serves clients in deepwater oil and gas, a segment split between a handful of multi-billion dollar companies and a universe of smaller private specialty firms. GATE was among the largest of the remaining independents, with the scale to support acquisitions and a healthy balance sheet with little debt. GATE saw an opportunity—GulfStar helped the company seize it. GATE management had worked extensively to establish an acquisition strategy to grow and diversify its business. The company participates in all stages of development for new deepwater oil and gas fields, with the life cycle of its projects often spanning more than a decade and providing GATE with substantial revenue visibility. Rather than react to the market downturn by delaying their growth plans, the company realized it had the chance to deal from a position of strength. This was their opportunity to acquire target companies at increasingly attractive prices while also getting a real-time stress test of how those businesses would perform in a difficult environment. That’s where GulfStar comes in. GATE needed a financial partner to provide funding for its consolidation strategy. GulfStar marketed GATE to a broad range of capital provider types, including traditional banks, non-bank private lending funds, business development companies and private equity groups. Many of them agreed that GATE presented a compelling opportunity. But that doesn’t mean it was smooth sailing. Traditional senior lenders were under pressure to trim oil and gas exposure of any kind, and publicly-traded business development companies were also strongly discouraged to invest. Great companies find ways to turn difficult situations to their advantage. GulfStar believed GATE’s planned acquisition program could almost certainly be fully financed with debt, avoiding costly dilution of management’s equity. They just had to find the right partner. And they did, through private lending funds. These pools of private investment capital have greater flexibility and seek opportunities during market dislocations. 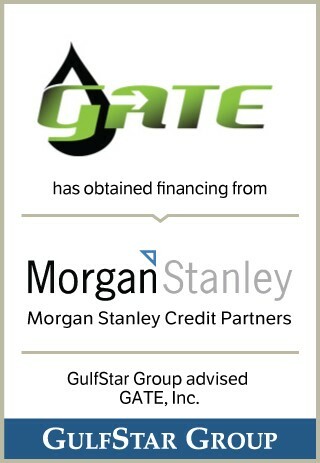 In April 2016, GATE closed on a $45 million acquisition line with Morgan Stanley Credit Partners. "Ashwin Krishnan and his colleagues at Morgan Stanley took the time to evaluate this opportunity on its own merits,” says Bryan Frederickson, GulfStar managing director who led the transaction team. “They recognized GATE’s potential, even under difficult market conditions, and I believe it will prove to be a terrific investment for them." In August 2016, GATE closed its first acquisition, which represented a new line of business for the company. But it won’t be the last. GATE is now poised to build a larger, more diversified company, with a supportive financial partner and lengthy roster of candidates. And GulfStar has since been approached by a number of management teams seeking to launch similar strategies. GulfStar was with us every step of the way - their sure-footed guidance helped us emerge from a challenging environment positioned for a strong and exciting future.